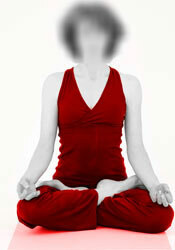 The asanas in this section are the basic poses that every yoga practitioner is supposed to know. You can try to learn yoga, but the best way to learn yoga is to experience it first hand. The basic poses are to be learned in the sequence presented. They are arranged in the approximate order of difficulty. Each new pose can be taken a new day. Sit in a legs-crossed position with the soles of your feet turned upward and heels pressed against the lower side of your abdomen. Keep your spine straight. Place your hands on your knees, palms up. Hold as long as you wish. This is one of the meditative postures. It imitates an inverted lotus flower. The head is held erect and the eyes closed during this posture. This promotes balance and harmony. Stand in an erect position with your feet together. Press the feet flat against the floor as if to stretch them. Visualize a string through the spine pulling you upward, lifting the knees, hips and hamstrings. Equally distribute the body weight. Keep your abdomen in and chest high. Your arms may remain at your sides. This is a basic posture of balance and control. It is the foundation for good standing posture. Stand in the mountain pose. Inhale slowly and raise arm overhead. At the same time, lift your left ankle behind you and clasp it with your left hand. Shift your weight to the right side. Exhale and pull the left leg toward your body and lean forward slightly while looking forward. Your right arm will provide balance. Hold for 20 seconds. Slowly release and return to start. Repeat to opposite side. This improves balance, coordination and quadriceps flexibility. Get into a seated position with legs extended forward. Rest your hands on your thighs and straighten your spine. Raise your arms in front of you to shoulder level. Then proceed to raise them overhead, bending slightly backward. Bend forward to your knees. Grab your knees and hold the stretch for 10 seconds. Your head should be bent forward. Pull your body forward to your knees with the elbows bent outward. Hold for 10 seconds. Place hands on your thighs and relax. This increases spinal flexibility and strengthens the back. Lie face down with arms at sides and head resting on either side. Slowly bring your head to center and rest your forehead on the floor. Place your hands underneath your shoulders with your fingertips facing inward. Tilt your head backward and begin raising your trunk. Push your hands against the floor and slowly start straightening your arms. Hold extreme position for 10 seconds. Slowly tilt your head forward and lower your trunk back to start. Relax and concentrate on the feeling in the legs, back and abdomen. 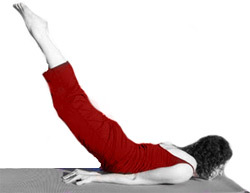 This removes tension from the spine and back, strengthens and firms the abdomen and buttocks. Get into a standing position, arms at sides. Your feet should be approximately six inches apart. Relax your spine. With your palms facing outward, raise your arms until they are in front of your chest, elbows bent. Straighten your arms. Then slowly bring them behind you, keeping them raised high. Interlock your fingers. Concentrate on the stretch in the shoulders and chest. Slowly bend backward. Maintain balance and control. Look upward and hold for 10 seconds. With knees locked, bend forward and bring your arms over your back. Hold for 10 seconds. Return to upright position. Unclasp your hands and concentrate on relaxing the neck, spine and shoulders. This strengthens and tones the muscles of the chest, back and arms. The rib cage expansion aids respiration. Slowly raise arms to sides until they reach shoulder level. Your palms should be facing down. Exhale and bend left until you can bring your left hand to your left knee. Keep your knees locked. Inhale and bring your right arm over as far as possible without bending the elbow. Hold the position for 20 seconds while breathing deeply and concentrating on the stretch. Slowly straighten and return to start. Relax for a moment, and then repeat to opposite side. This trims the waistline, relieves tension in the neck and back. Stand in the mountain pose. Bend forward. Bring your arms behind your knees and clasp your hands. Be certain to position your hands securely behind your knees and slowly draw your upper torso down as far as comfortable. Your head should be lowered and directed toward your knees. Hold for 10 seconds. Lower hands to calf level. Again draw your body inward. Hold for 10 seconds. Unclasp your hands, inhale deeply and raise your trunk back to start, one vertebra at a time. This tones and firms the thighs and calves. It also improves hamstring flexibility. Lie on your stomach, arms at sides and chin resting on the floor. Bend your knees, feet together. Reach your arms back and grasp your ankles. Slowly raise your torso while arching your back until the abdomen bears the bodyweight. Tilt your head back and hold for 10 seconds. Slowly lower until chin is resting on the floor. Release your grasp and lower feet to the floor. Lie flat with head turned to one side. Rest and observe the feeling in the pelvic region, back, arms and legs. This shapes and tones hips, thighs, buttocks and abdomen. It strengthens lower back and promotes flexibility in the chest, shoulders, back and arms. Sit on the floor. Place your right sole against your left thigh. Cross your left foot over the right knee and place the sole of your foot firmly on the floor. Position your left hand before you. Bring your right arm to your left knee and firmly grasp it. Slowly twist your trunk and head to the left. Your left arm will then be placed around your waist and rested on your right side. Keep your chin close to your shoulder. Hold for 10 seconds. Slowly move our of the posture and relax. Change leg position and repeat to other side. This releases tension from the spine and promotes spinal flexibility. Sit on the back of your heels with your feet close together. Slowly move your arms backward, and then place them securely on the floor behind you. Drop your head backward while inhaling and expanding your rib cage. Arch your spine. Hold extreme position for 15 seconds. Walk hands forward and return to start. Relax for 10 seconds and repeat. This increases flexibility in ankles, feet and spine. It also strengthens the abdomen and lower back. Get into a seated position. Pull your heels into your groin area and grasp your feet. Keep your spine straight. Hold extreme position for 10 seconds. This firms the thighs and promotes knee and inner-thigh flexibility. Lie flat on your back with arms at your sides. Your palms should be facing down. Slowly raise your legs. Use your hands to push against the floor as you lift your trunk. Continue lifting until your legs are lowered beyond your head with your toes touching the ground as near to the head as possible. Once you have moved as far as comfortable, press your chin against your chest. Place your hands on your back with elbows on the ground. Hold for 20 seconds. Slowly unroll back to a lying position. Press your hands against the floor for support of your body weight. This promotes spinal flexibility and deep relaxation of all the muscles. It also improves the functioning of the internal organs by supplying them with extra blood. Place your hands at your sides, palms down, and begin to raise your legs. Press your hands against the floor to push your legs upward. Place your hands on hips, elbows on the ground. Try to straighten your legs and hold them upward. Your chin should be tucked in against your chest. Close your eyes and relax. Hold for 10 seconds. Bend your knees, release your hands, and slowly return to start, one vertebra at a time. This promotes circulation in chest and neck. It is also said to stimulate the glands, in particular the thyroid. Lie down, face up, with your legs crossed as in the Lotus posture. Cross arms over and around your head. Let your body weight drop naturally. Do not force the position. Breathe naturally and hold as long you wish. Change leg position and repeat. This loosens shoulders and hip joints and relaxes the body. Lie on the floor, face down. Rest your chin on the floor and place your hands at your sides. Make a fist with each hand and place them firmly against the floor at approximately thigh level. Raise your left leg slowly while pushing against the floor with your fists. Raise as high as comfortable. Hold for 10 seconds. Lower leg to ground. Relax for sometime. Raise your right leg and follow the same procedure. This strengthens the abdomen, buttocks and lower back. Lie flat on the floor, face up, with arms at the sides. Lie motionless and observe your breathe. Study the flow of breath and quiet your mind. Feel a relaxing force move slowly up the body. It starts at the toes and moves slowly to the ankles, calves, knees and so on. Visualize a quiet stream of gentle energy removing tension from your body. Roll to your side and sit up and observe the feeling of deep relaxation. This invigorates the body and mind through conscious relaxation.